In zoology, a seal is any pinniped other than a walrus. There are two main groups of these large, aquatic, mostly marine mammals. Earless seals (or "true seals" or "crawling seals") belong to the taxonomic family Phocidae (phocids). Eared seals (or "walking seals") are members of the family Otariidae (otarids) and include fur seals and sea lions. As with all pinnipeds, seals have both front and hind limbs in the form of flippers and belong to the taxonomic group Pinnipedia, which is variously considered a suborder or superfamily of the order Carnivora or a separate order. Pinnipedia only includes seals and walruses. Walruses are generally considered a separate family of pinnipeds, the Obobenidae, although sometimes they are included with the phocids (McKenna and Bell 1997). Seals play an integral ecological role, eating crustaceans, squids, and small fish, and being eaten by orca whales, bears, sharks, and some by walruses. They also offer aesthetic values to humans, who delight in observing them in the wild and in zoos and aquariums. Although protected by the laws of many countries, seals are facing threats due to a number of anthropogenic factors, include overhunting, overfishing of seal prey, pollution (such as oil slicks, plastics, lost fishing nets), and loss of habitat. Even very young harp seals are hunted for their valuable pelts, which yield oil (used as health supplements and in industry) and fur (used in the fashion industry). There are 32 or 33 recognized species of pinnipeds, including 14 otariids and 18 or 19 phocids (one, the Caribbean monk seal, may be extinct). (See classification.) One seal, the Baikal seal or nerpa (Phoca sibirica) lives in Lake Baikal and is the world's only freshwater seal; two subspecies of the ringed seal, though, also spend their whole lives in freshwater. Seals are typically sleek-bodied and well adapted to their aquatic habitat. In place of hands, their forelimbs are large flippers, and their bodies narrow out into a tail. Pinnipeds are more streamlined, larger, and faster swimming than the sea otters, which have retained the front paws of a terrestrial carnivore, although their hind feet are flippers (Riedman 1990). Seals spend most of their lives in the ocean, with the major exception of breeding and raising their young, which they do on land. The other major groups of marine mammals are either entirely aquatic (cetaceans and sirenians) or can breed and raise their young at sea (sea otters). The smallest seal is the Galapagos fur seal, which weighs about 30 kg (66 lb) when full-grown and is 1.2 m (4 ft) long. The largest seal is the male southern elephant seal, a phocid. It is over 4 m (13 ft) long and weighs up to 2,200 kg (4,850 lb, more than 2 tons). All seals are carnivorous, eating fish, shellfish, squid, and other marine creatures. The leopard seal is probably the most carnivorous and predatory of all the pinnipeds, eating a wide variety of prey, from krill to penguins to other seals. In addition to the presence of the pinna, there are other obvious differences between otarids and phocids. Otarids have hindflippers that can be inverted under the body, aiding their movement on land, while the hindflippers of phocids cannot be turned forward under the body, causing their movement on land to be slow and awkward (Riedman 1990). Otarids also swim using their long front flippers to move themselves through the water, while phocids swim by using their rearflippers and lower body in a side-to-side motion (Riedman 1990). There are also behavioral differences, including the breeding systems of the two groups (see below). Only earless seals live in the Antarctic and Arctic; there are no otariids in the extreme polar regions (Riedman 1990). On the other hand, only two species of phocids (the endangered Hawaiian and Mediterranean monk seals) are found in the tropics and these are small populations, while a number of fur seals and sea lions live in tropical and subtropical areas, with fur seals ranging widely into colder climates as well (Riedman 1990). All but two species of fur seals are found in the Southern Hemisphere, while sea lions are common to both hemispheres. No seals are found in Asia (Riedman 1990). Although fewer species of seals inhabit the Antarctic than the Arctic, the Antarctic seal populations are larger in number and generally larger in body sizes (Riedman 1990). Seals breed and raise their young on land (or, in some cases, on ice). Otarid seals tend to have similar breeding systems, while phocid breeding methods are more variable. All sea lions and fur seals are highly polygynous, with dominant males having more than one female sexual partner, and with males being two to four times larger than the females (Reidman 1990). Adult males are normally territorial and go without eating during the breeding season (Riedman 1990). Females give birth soon after hauling out of the sea onto a male's territory, and alternate feeding with nursing of the pup (Riedman 1990). Phocid breeding behavior varies with species. Some, such as the Arctic ringed seals, breed in solitary, monogamous groups, with just the male, female, and pup, and with the male and female of equal size (Riedman 1990). Others, such as the elephant seal, are polygynous, involving dominance hierarchies, and with large differences in size between the male and female. Some phocids, such as the elephant seals and the grey seals, breed in large groups that may have hundreds of animals (Riedman 1990). In general, male otarids defend a territory, whereas phocids with a dominance hierarchy defend clusters of females. These strategies may reflect the different levels of mobility on land between otarids and phocids, with the otarids' opposable hind flippers that can be placed flat on the ground aiding locomotion. After giving birth, pinniped mothers suckle their young for a variable length of time. Unlike otariids, which nurse the pups for several months while alternating feeding at sea, most phocid females nurse for short periods while fasting or feeding little (Riedman 1990). Among the phocids, lactation varies from 4 to 50 days, whereas the otarids may lactate from 4 to 36 months. This reflects the fact that phocid feeding grounds tend to be a long way offshore so lactation is associated with maternal fasting. To compensate for the short lactation period, the fat content of phocid milk is higher than in any other species of marine mammal (45–60 percent fat). After lactation, most female phocids make extensive migratory movements to feeding grounds for intensive foraging to recoup depleted energy reserves. On the other hand, otarid feeding grounds are generally closer to shore and females go on foraging trips to maintain lactation. Fat content of otarid milk is lower than that of the phocids owing to the protracted lactatory period (typically 25–50 percent). Protracted nursing also leads to the formation of social bonds. Females have a postpartum oestrus allowing them to mate soon after giving birth. Subsequent implantation of the embryo is delayed (embryonic diapause) thus removing the need to come ashore (haul-out) twice, once to give birth and again later to mate. All otarids copulate soon after birth, while most phocids mate during late lactation or after weaning their pup (Riedman 1990). The true seals or earless seals are all members of the family Phocidae. They are sometimes called crawling seals to distinguish them from the fur seals and sea lions of family Otariidae. Phocids are more highly specialized for aquatic life of the two groups and, unlike otariids, lack external ears and cannot bring their hind flippers under their body to walk on them. They are more streamlined than fur seals and sea lions and can therefore swim more effectively over long distances. However, because they cannot turn their hind flippers downward, they are very clumsy on land, having to wriggle with their front flippers and abdominal muscles; this method of locomotion is called galumphing. Additionally, true seals do not communicate by "barking" like the fur seals and sea lions. They communicate by slapping the water and grunting. While otariids are built for speed and maneuverability in the water, phocids are built for efficient, economical movement. This allows most phocids to make long foraging trips to exploit prey resources that are far from land, whereas otariids are tied to rich upwelling zones close to their breeding sites. The Hawaiian monk seal is listed as endangered, and the Caribbean monk seal has not been seen since 1952 and is considered to be extinct. The phocid reproductive cycle is characterized by temporal and spatial separation between feeding and maternal investment; in other words, a pregnant female spends a long period of time foraging at sea, building up her fat reserves, and then returns to the breeding site and uses her stored energy reserves to provide milk for her pup. It should be noted that the common seal (harbor seal in the U.S.), Phoca vitulina, does not separate foraging and maternal investment; instead, it displays a reproductive strategy similar to those of otariids, in which the mother makes short foraging trips between nursing bouts. The eared seals (or walking seals), family Otariidae, are the fur seals and the sea lions. These are barrel-shaped marine mammals, adapted to a semi-aquatic lifestyle. They are slightly less adapted to the aquatic lifestyle than the true seals are. Some taxonomists suggest that the differences between the fur seals and the sea lions are not great enough to separate them into the subfamilies Arctocephalinae and Otariinae (Riedman 1990). 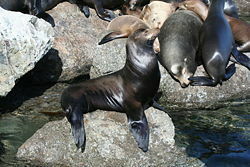 The Guadalupe fur seal and Steller sea lion are listed as threatened status on the endangered species list. Fur seals alone make up the Arctocephalinae subfamily. They include the genera Callorhinus and Arctocephalus. Like their close relatives, the sea lions, fur seals retain small but visible external ears, and retain some ability to walk on land, as their hind limbs can be brought forward under the body to bear the animal's weight. Fur seals have a more pointed snout and longer foreflippers than sea lions, and they have a thick, luxuriant coat of fur (pelage) (Riedman 1990). The underfur, which is waterproof, is covered with long, "guard" hairs that give them a "somewhat grizzled appearance" (Riedman 1990). Fur seals are generally smaller than sea lions. All fur seals except the northern and Guadalupe fur seals are found in the Southern Hemisphere (Riedman 1990). The northern fur seal (Callorhinus) differs in a number of ways from the other species of fur seals, including morphologically (shorter rostrum that curves downwards, longer ear pinna, etc.) and being more pelagic than most other species, spending 9–10 months at sea (Riedman 1990). Fur seals used to be called "sea-bears" and the genus Arctocephalus derives from the Greek words arktos, "bear," and kephale, "head" (Riedman 1990). Sea lion make up the Otariinae sub-family. This subfamily includes the genera Eumetopias, Neophoca, Otaria, Phocarctos, and Zalophus. Like fur seals, sea lions are characterized by the presence of external ear pinnae or flaps, long front flippers, and the ability to walk on four flippers on land. They have a more rounded muzzle and shorter foreflippers than fur seals, and their pelage is more short and coarse (Riedman 1990). 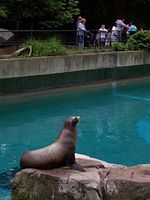 Sea lions are generally found in coastal waters of the temperate to subpolar regions of both Northern and Southern hemispheres. Sea lions are often a popular attraction at zoos and aquariums, performing tricks such as throwing and catching balls on their noses and clapping. Sea lions of many species have seen a severe and rapid decrease in numbers in recent years. Many factors, including overfishing of other species, shooting by fishermen, and pollution, have contributed to the decline. The population of Steller's sea lions in Alaska has declined as much as 80 percent since the 1970s (Clover 2004; Dalton 2005). The following is one possible classification of extant (living) species of seals. However, biological classification is an ever-developing process. At one point, phocids were split into three subfamilies—Cystophorinae, Monachinae, and Phocinae—but recent classifications recognize only two subfamilies, Monachinae and Phocinae, with the elimination of the subfamily Cystophorinae (Riedman 1990). Many also no longer recognize tribes of monachines, although they are included below. Dalton, R. 2005. Is this any way to save a species? Nature 436:14–16. Riedman, M. 1990. Pinnipeds: Seals, Sea Lions, and Walruses. Berkeley: University of California Press. Tree of Life Web Project. 2000. Carnivora. Dogs, cats, bears, raccoons, weasels, mongooses, hyenas, seals, walruses, etc. Version 01, January 2000. Tree of Life Web Project. Retrieved January 23, 2007. Wozencraft, W. C. 1992. Order Carnivora. In Mammal Species of the World: A Taxonomic and Geographic Reference, 2nd. ed. Edited by D. E. Wilson and D. M. Reeder. Washington: Smithsonian Institution Press.